To melt chocolate, microwave on Medium for 1 minute. Stir, then continue microwaving on Medium, stirring every 20 seconds, until melted. Line a baking sheet with parchment paper. Insert a popsicle stick into each piece of banana. 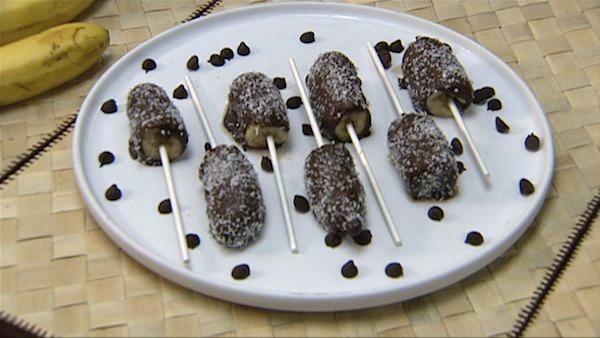 Cover each piece with melted chocolate using a rubber spatula and sprinkle with coconut. Place the bananas on the baking sheet and freeze until frozen, about 2 hours.